The 76th Air Service Group arrived in Guam on April 14, 1945. The 76th Air Service Group was activated at Warner Robins Field (near Macon, Georgia, on 11 May 1944), as one of the new "streamlined" air service groups. Lt. Col. Blume was the first commanding officer. Camera repair courses in San Antonio, Texas prepared men in the photo unit to join 76th ASG and proceed to Warner Robins, Georgia. The 588th Engineering Squadron was to provide third echelon maintenance, salvage and reclamation of all items of equipment, for one combat group in a theater of operation. The 582nd Materiel Squadron was to provide complete third echelon supply on a thirty-day level. On 18 August 1944, the Group moved in two trains to Great Bend, Kansas, arriving there on the night of 20 August 1944. On 18 August 1944, the Group entrained for Great Bend, Kansas, where it entered a period of combined training, and later passed final inspection for foreign service. The mission of this Group is the provision of third echelon maintenance and supply services and complete station complement services for one combat group. Headquarters and Base Services Squadron was to provide service Group Headquarters and station administrative personnel for a combat group stationed in a theater of operations to include finance, fixed communications, medical dispensary service, interior guard and internal security, station utilities, fire fighting service and central motor transportation pool. The final bivouc of the training period was started on 16 December 1944. The distance covered was one-hundred-seven (107) miles, over good roads, in clear and cold weather. The camp site was near Stockton Lake in hilly and bare terrain. The exercise ended on 18 December 1944, and the Group returned to Great Bend. The POM inspection was passed in January 1945 and all training and packing completed. Men and officers were given their pre-embarkation furloughs and leaves. On 27 and 28 January, a convoy and bivouac party was given at Wichita, Kansas, by the officers for the enlisted men. Eighty miles of the hundred and twenty-mile trip was made through a driving snow storm. The port call was received in February 1945, and all activities were devoted to the movement to the staging area. The advance party of six officers and six enlisted men was sent to the Port of Embarkation. The first section of the group, comprising the Headquarters and Base Services Squadron, entrained at Great Bend, March 5th, and proceeded to the staging area at Fort Lawton, Washington. Lt. Col. Hayes was train commander. The first section arrived at the staging area March 8th and was quartered in a temporary area set up by the advanced parties of the organization. The second section of the group, which included the 582nd Materiel Squadron and the 588th Engineering Squadron, with Lt. Col. Blume, commanding officer of the group, as train commander, entrained at Great Bend March 6th, for the staging area and its ultimate destination. This section arrived at Fort Lawton on March 9th, and rejoined the Headquarters and Base Services Squadron at the temporary headquarter. During the next three days at the staging area the group received its final processing for clothing and equipment shortages, records and physical examinations. Orderly rooms were set up in one crowded building for the three squadrons and for furnishing details of men for various post and squadron function. At reveille on the morning of March 15, the group was alerted on orders from Fort Lawton staging area, for embarkation to the overseas destination. On March 16th, the group left Fort Lawton in a truck convoy for the Seattle Port of Embarkation to board the USS Dorthea L. Dix, a naval transport. Two Air Service Groups, namely the 76th and the 73rd, were aboard the USS Dix with Col. F.M. Durfee as the troop commander. On the evening of March 16th, the ship left the harbor enroute to San Francisco, California. After spending eight hours anchored in the harbor taking aboard additional supplies, the USS Dix departed for our next port, Pearl Harbor in the Hawaiian Islands, and on Sunday morning, March 25th, the ship anchored in the harbor. March 29th the ship weighed anchor and proceeded in convoy to our next port of call and, as the month ended, the group was headed to Eniwetok in the Marshall Islands. The officers of the group were crowded into small staterooms below the decks while the enlisted men were crowded into the holds of the ship. Living conditions were poor, due to the condition of the ventilation system which failed to operate during most of the trip. Because of this and the extreme heat below decks, it became necessary for both men and officers to spend most of their time, both day and night, on the topside. The International Date Line was crossed on 1 April and all members of the Group were initiated into the "Sacred Order of the Golden Dragon". Eniwetok was reached on 7 April 1945 and the USS Dix left the next day. On the morning of 11 April 1945, the voyage ended atPearl Harbor, Guam. On shipboard, the question always was, "Where are we going?" Armas Kajander made his own sextant with mirrors, shooting the sun, so to speak, and was able to ascertain somewhat the area in which we were located. Gunnery practice for the Navy was conducted by giving at a tow target pulled by an airplane. The shots looked good to the 76th, but the USS Dix continued to veer back and forth to avoid submarines that might be lurking in the area. We were accompanied by other ships in the same convoy, protected by the appropriate defense ships in the fleet. On occasion, depth charges were rolled out when suspicious underwater sounding was encountered. Chaplain Perkins conducted religious protestant services on board ship. Jewish and Catholic services were conducted by personnel of the group. Movies were shown and an orchestra was formed to provide entertainment for the crowded ship. Abandoning ship drills were practiced in the event of enemy attack. The group debarked on 12 April 1945, and moved by truck to Northwest Field, Guam. Debarkation was affected by lighters, all personnel going over shipside in full pack using nets. The advance party of the organization met the group as it arrived in the area. "C" rations had been secured and were distributed to the men and officers. For the next five days everyone ate cold "C" rations for no heating or cooking facilities could be secured. During the first five days a group mess was established and a screened mess kitchen was erected as a temporary mess after which regular rations of hot food were served. The long voyage of twenty-six days during which no one was permitted to go ashore at ports of call; poor messing facilities and crowded quarters had very greatly lowered the morale of the Group. The opportunity to work, even under the primitive conditions of camp life, immediately raised it. Water was not available at the camp and had to be hauled to the site in large tank trucks from another section of the island and placed in lyster bags thoughout the squadron areas for drinking purposes. Water for washing and bathing purposes was placed in five gallon cans while the steel helmet became one of the most important pieces of equipment carried by the men and was used for washing, bathing and washing clothes. The setting up of the camp continued at a rapid pace despite the fact that blasting and dynamiting of trees and coral was carried on by the aviation construction engineers in and about the area. Rocks, stumps, tree limbs and splinters rained in the camp with each blast and crashed through tents with minor injuries to the personnel of the group. Most men took cover when they heard the warning "fire in the hole" but most charges were set off without warning and avoidance of many a serious accident was a matter of luck. By the end of April, the camp grew from a dense jungle area to a livable camp with electricity, radio, barracks and excellent messing conditions. Actual construction work in the 76th area started on 13 April 1945. The entire camp was built by Group personnel. The jungle was cleared ahead of the construction work by the Army Engineers. During the first week of the new camp, a temporary Post Exchange was set up in a squad tent to enable the men to buy cigarettes, beer and toilet articles. Since the organization did not have Post Exchange funds and was not permitted to become part of the island's Post Exchange setup until a permanent building had been erected, the officers and men lent money to build up an operating fund until a permanent exchange could be established. On the second weekend, a theater had been set up for the showing of movies to the group each night. A screen was erected and a small hut was built to house the projection equipment, while seats for the outdoor theater were made from discarded bomb crates. The first entertainment was presented April 28th by the group orchestra and two entertainers from the 16th Bomb Group. On the second Sunday morning, the first church services were held in the open air by Chaplain Perkins. A large number of the group turned out for the first service in the new camp. A number of officers and men were assigned to duty with Headquarters of the 315th Bombardment Wing and others placed on detached service in the Wing. Numerous reassignments were made within the Group. The Group Guard Section was consolidated with the other guard sections of the military police and fire company. The need for large amounts of water being used in the photographic process required a huge water tank. A large drainage pit had to be dug in solid coral rock. Digging a holding pit in solid coral rock caused sore backs and tired bodies but all 76th ASG personnel pitched in to complete the project. During the month of May, the morale of the men in the Group increased considerably, which was mainly due to the announcement of VE-Day in Europe. 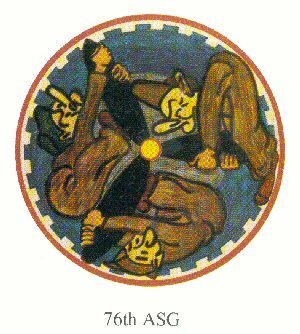 The final step in reorganization and consolidation of the four service groups serving this area was taken during the last week of July by Special Order #98 dated 29 July 1945, Headquarters 315th Bombardment Wing. This Special Order placed all personnel present for duty with the other three groups (24th, 73rd and 75th) on detached service to 76th ASSG with new assignment to be effective 1 August 1945. This step results in the formation of one Provisional Group comprised of the four groups formerly operating individually. Its object to unify command, making one commander responsible for the overall activities of the Service Center Personnel.